So part of my trip took place close to the 72nd anniversary of the United Nations charter being approved. Interstingly enough that auspicious interntational meeting took place in San Francisco and the city has an entire plaza dedicated to it. The plaza is part of the Civic Center in downtown, at its center is a wonderful fountain that is a sunken pit with water raging in to it and from what I hear it has become a bathing pool for the city’s homeless. In fact the entire area is a bit run down with trash and piles of “stuff” that belongs to homeless folks. But the history of the place is not lost on me, nor is its connection to Star Trek. Star Fleet Academy is located in San Francisco as well, however, its not necessarily where the UN Plaza is located but more to the northwest by the Presidio, near the South end of the Golden Gate bridge, and Fort Baker/Horseshoe Bay on the north end of the bridge in Marin county (yeh, I am a bit of a Treky, not crazy, but have enough tid-bit info). Which is where my first adventure of the City trip begins in Marin County. John Muir, the naturalist, the father of modern day conservationist movement, environmentalists and of coarse, lets not forget, our AMAZING National Parks! I take pride in having visited his namesake national monument in Marin County just north of the City on the other side of the Golden Gate Bridge. I admit some would call Muir a crazy person that rambled along in the woods, but he was a crazy person who’s ideas illuminated the future and have left an impact on our society. Unlike so many other crazy people, he was actually crazy enough to get a following and mainstream his ideas. I have to also admit at this point that one of my first National Park experiences was at Sequoia National Forest and Kings Canyon National Park. That is where I first heard the name John Muir and where I also fell in love with the outdoors. It was suiting then that when I went off to UCSD I chose John Muir College as my first choice because the college promoted Muirs ideals on nature, and also, it had the least amount or most flexible general education requirements out of all the other colleges that made up the undergraduate system at UCSD. 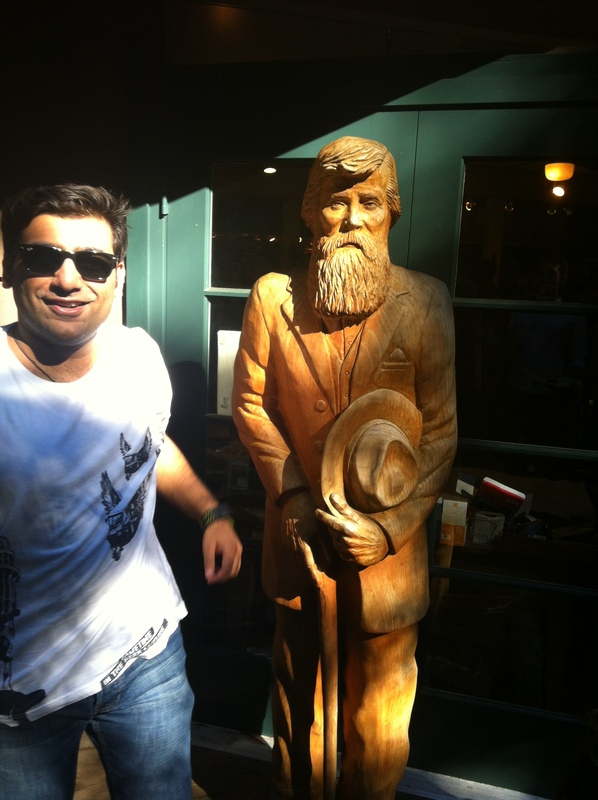 Me running away from John Muir carving after being told that he might have been a crazy man who had bouts of random insanity that resulted in his aimless wandering in the hinterlands of California. 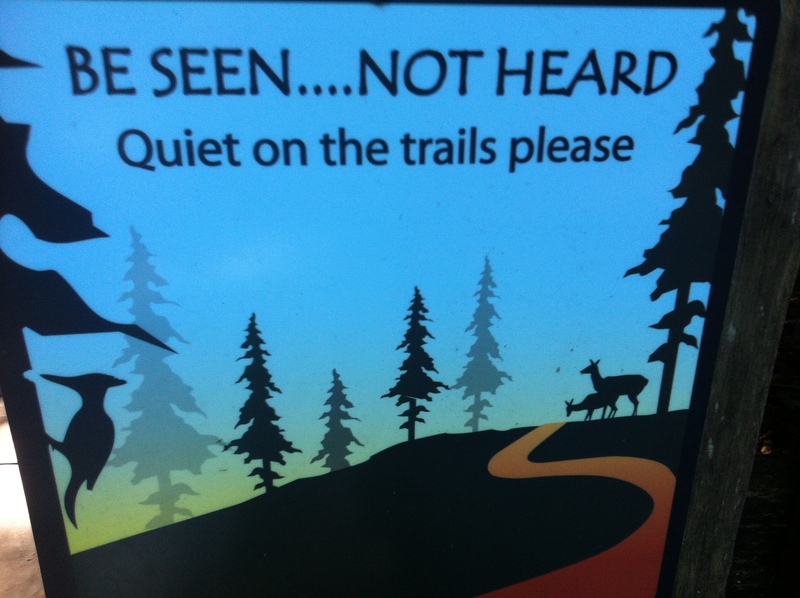 Signs telling us to be seen not heard, which I had a hard time with…I dont apply my indoor voice partly because I don’t ever use it. Back to my problem of not being quite. The John Muir National Historic Site has an interesting history, you all should check it out on wikipedia. The trail itself is between 1-2 miles and literally is like walking on a boardwalk in Atlantic City (God help those Americans as they suffer through Hurricane Sandy) but through a forest. There was a debate between my brother and I as to whether the forest could be considered “enchanted” or “magical” which got heated because his definition for the two were flipped around. Therefore, I was constantly reminded that I should be seen, not heard. 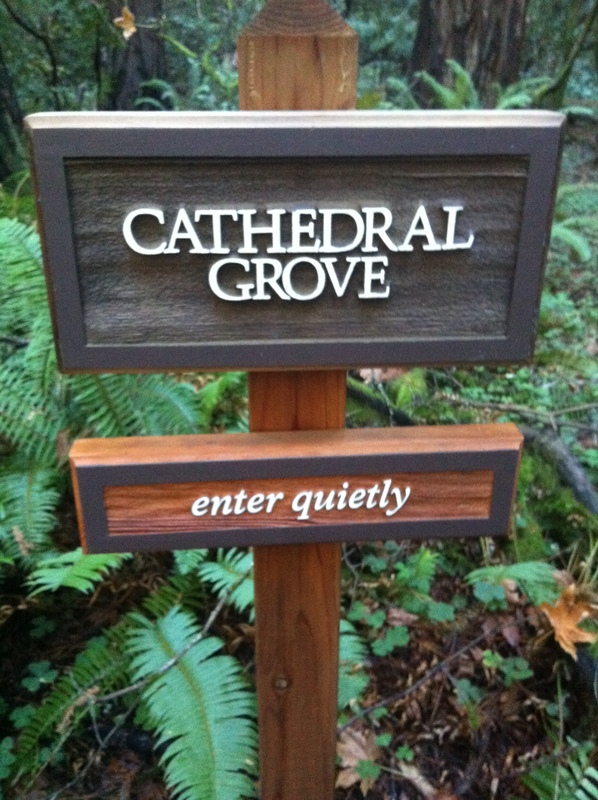 While wandering on the main trail we came upon Cathedral Grove. What I learned was just a crazy interesting intersection of things that interest me- our national parks, Muir woods, San Francisco and the United Nations. In 1995 the UN turned 50 years old. They held a special commemorative ceremony in tribute of this anniversary at Cathedral Grove. Originally in 1945, shortly after the death of President Franklin Roosevelt a commemorative ceremony was held in the same Cathedral Grove location to mark the passing of one of the founders of the UN. 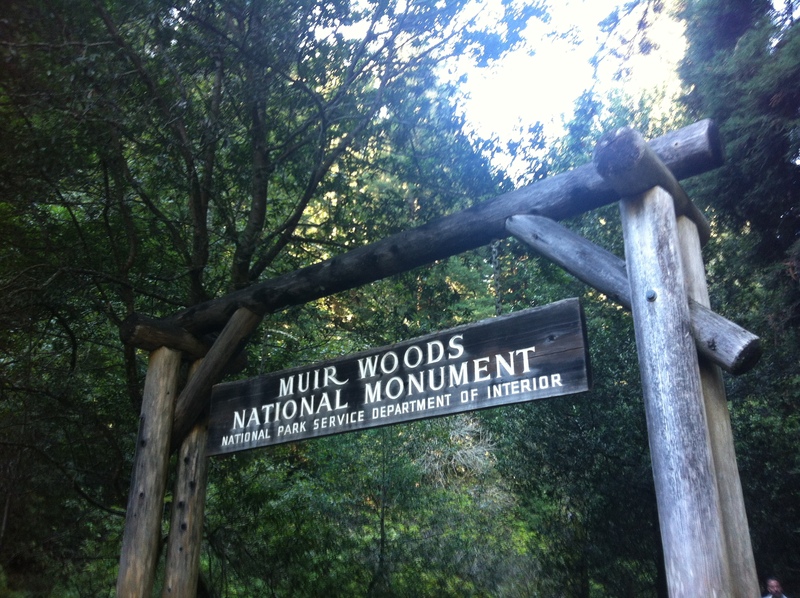 All 50 signatories of the UN Charter hiked their way up to Muir Woods to take part in the ceremony. There is a plaque there an everything for you to read up on it when you go. It was actually a really great experience to visit not just the UN Plaza in San Francisco but then to have stumbled upon another piece of UN history at Muir Woods.